Starlet. Screen Siren. The Most Beautiful Woman in the World. All phrases used to describe 1940’s Hollywood actress Hedy Lamarr, whose ravishing visage was the inspiration for Snow White and Cat Woman. Alexandra Dean’s illuminating documentary adds Inventor to the list. Known for her matchless beauty and electric screen persona, Lamarr’s legion of fans never knew she possessed such a beautiful mind, whose concepts were the basis of cell phone and bluetooth technology. An Austrian Jewish émigré who acted by day and drew mechanical and electronic inventions by night, Lamarr came up with a “secret communication system” to help the Allies to beat the Nazis. Weaving in Lamarr’s own voice from archival recordings, Dean reveals how Lamarr gave her patent to the Navy, received no credit for her contributions, and wound up impoverished in her latter years. 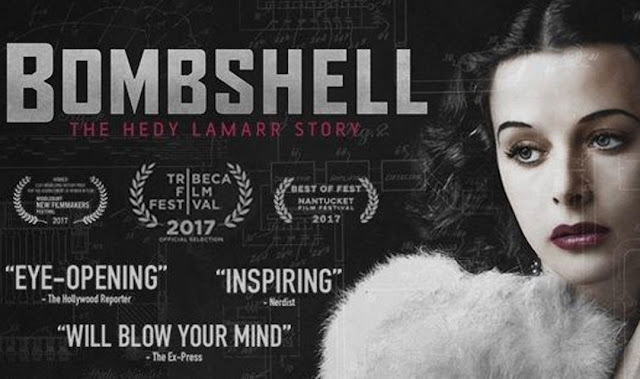 Bombshell: The Hedy Lamarr Story is a film for lovers of history, Hollywood and science. See https://zeitgeistfilms.com/film/bombshellthehedylamarrstory for local playdates. Be sure to see it in theaters as soon as possible, as it will be out of most theaters this week.